Gosuke lives is a small mountain village known for its steel. His father inherits the position of Murage, or foreman of steel production: a title that will pass to Gosuke in time. 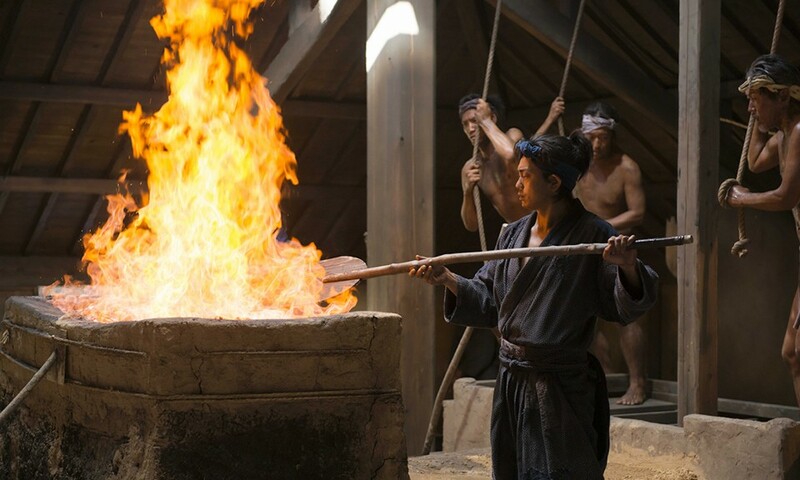 However, Gosuke would rather leave the village to join Oda Nobunaga’s armies and prove his strength as a warrior. Following a catastrophic defeat Gosuke returns to the village where he is welcomed back. But there is danger lurking as the village is under threat and with the modern guns revolutionising warfare Gosuke must learn how best to defend his village and his heritage. Yoshinari Nishikori who wrote and directed this historical drama does a good job with the story. Creating a few strong central characters, Gosuke, his noble friend Shinnosuke, and the salesman Yohei, the film’s story is small in scale but more impactful for it. The direction is good and the cinematography exceptionally beautiful. Costumes and set design evoke the period incredibly well and the village feels real and lived-in. Though the battle sequences are far from the main focus, they are well choreographed and performed. The best parts of the film are the steel making sections. Though essentially only showing the process of making steel, they are imbued with emotional and thematic depth that makes them fascinating to watch both on a technical and dramatic level. The message of “Tatara Samurai” is one of appreciating life and respecting your heritage. The protagonist of the film begins by saying that he was never sure what “strength” truly entailed and the film deals with this theme. Strength is all too often conflated with violence and war, but there is another strength in courageous acts of defence and in the calm, daily grind of survival. A charmingly well-made samurai tale with beautiful cinematography and a novel take on the everyman hero.